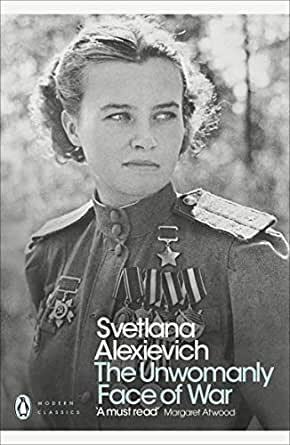 Bringing together dozens of voices in her distinctive style, The Unwomanly Face of War is Svetlana Alexievich's collection of stories from Soviet women who lived through the Second World War: on the front lines, on the home front, and in occupied territories. As Alexievich gives voice to women who are absent from official narratives - captains, sergeants, nurses, snipers, pilots - she shows us a new version of the war we're so familiar with, creating an extraordinary alternative history from their private stories. Published in 1985 in Russia and now available in English for the first time, The Unwomanly Face of War was Alexievich's first book and a huge bestseller in the Soviet Union, establishing her as a brilliantly revolutionary writer. The unforgettable oral history of Soviet women's experiences in the Second World War from the winner of the Nobel Prize in Literature. I cried so many times reading this book that I forced myself to stop and not pick it up again the next day multiple times. I am not one to write reviews, but for those of us who were lucky enough to have never seen war, know conceptually that it's a terrible thing, and somehow idealize the heroism of it, this book will set you straight. Once I started reading, I could not stop. Between tears and tissues, I kept reading. I read until I was sobbing so hard I couldn't see through my tears. The feelings of fear, pain, courage, grief, hope...of girls half my age...it was heart-wrenching. At their age I was having first world teenager problems of pimples and wanting to be popular. I could not be more embarrassed. These stories cannot be made up - not something this raw, this brutal, this...human. I write this review in the hopes to encourage more people to read it. There's no need to convince people that war is bad. This book will show you - straight to your heart. There aren't enough stars for this book, the best war chronicle ever written.Theirs was the first generation lifted from serfdom, they became doctors, nurses, pilots, snipers, drivers, tank commanders, partisans and regular infantry. They were wounded, tortured, raped and killed. After indescribable horrors they returned to their villages and were often rejected as trench whores. The book is not nihilistic but very sobering: A species that produces such people has a fighting chance. It is essential for anyone wishing to understand Russia, Communism, or German fascism. One fragment: "As soon as I begin telling this story, I get sick again. I’m talking, my insides turn to jelly, everything is shaking. I see it all again, I picture it: how the dead lie—their mouths are open, they were shouting something and never finished shouting, their guts are ripped out. …And how frightening! How frightening is hand-to-hand combat, where men go at each other with bayonets…Bare bayonets. You start stammering, for several days you can’t get the words out correctly. You lose speech. Can those who weren’t there understand this? How do you tell about it? With what face? Well, answer me—with what face should I remember this? Others can somehow…They’re able to…But me—no. I weep. Yet this must be preserved, it must." Alexievich, Svetlana. The Unwomanly Face of War: An Oral History of Women in World War II (p. 330). Random House Publishing Group. Kindle Edition.